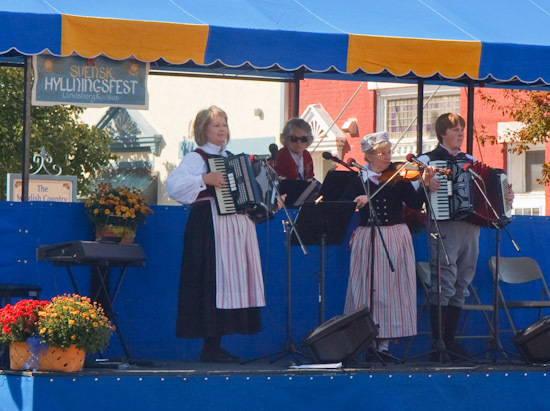 Welcome to Lindsborg Town Talk, your source for news about upcoming events and activities in Lindsborg. Unwrap the Magic of Lindsborg, our six-week holiday and Christmas celebration continues today with a wide variety of events throughout town. 3 Lindsborg Bed and Breakfasts will host holiday open houses today from 2 to 5pm. The Rosberg House, Seasons of the Fox and the Swedish Country Inn are all participating. The Rosberg House, at 103 E. State, will feature Davin Olson on the Nyckleharpa and will serve holiday treats. At the Seasons of the Fox, 505 N. 2nd, pianist Genevieve Bishop will be playing Christmas music and visitors can enjoy peppermint ice cream, hot cider and cookies. The Swedish Country Inn will feature the woodwind trio, Trablas. Personalized chocolate Dala Horses, gingerbread men and Christmas tree ornaments will be available, plus there will be a spritz cookie demonstration. Tomorrow, Sunday December 21st, the Messiah Lutheran Church will hold their annual Christmas Candlelight Service at 7pm. The candle light service is the last event of the church’s 100th anniversary year and the choir is planning a very special program. There is no admission fee and guests are invited to stay for coffee and refreshments following the service. Bethany Lutheran Church invites the community to three special Christmas services. The Christmas Eve service is on Wednesday at 10pm. This is a quiet, meditative candlelight service with Holy Communion. Julotta, which means early Christmas Morning, will be held on Thursday at 6am. The Annandag Jul service is Friday at 10am, and will be conducted in Swedish, with an English interpretation. On a personal note, this is my last scheduled broadcast of Lindsborg Town Talk. I appreciate the opportunity I had to share activities in Lindsborg with all of the listeners of this program. For the last time, this is Mike Rodriquez with Lindsborg Town Talk. The High School Swedish Folk Dancers Swedish bake sale starts off the day, with proceeds going towards TACOL’s Christmas Food Basket Project. 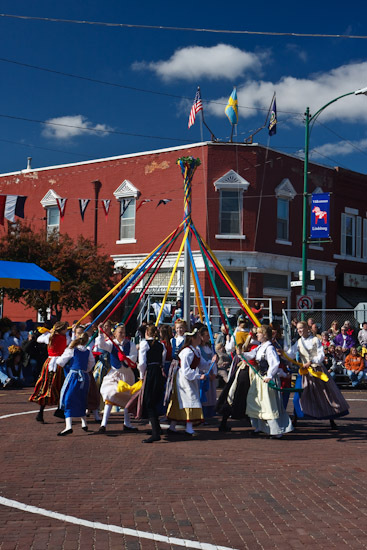 Today marks the highlight of the Christmas season in Lindsborg with the Lucia Festival. Special music begins at 9:30 at the Bank of America, where performers will include the Bethany College Ensemble, the Lindsborg Folkdanslag, the Flute Choir and the Smoky Valley High School Brass Ensemble. At 11:30 you can share in the telling of the Lucia story by Soderstrom Elementary students at the Bethany Lutheran Church. 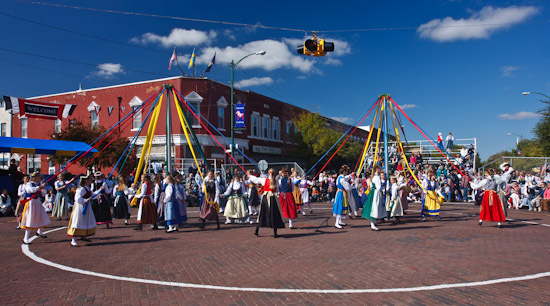 The Lucia Festival officially begins at 2:30 in downtown Lindsborg, where the court will make their way to Bethany Lutheran Church for the crowning of this years’ St. Lucia, Eleanore Johnson, at 3pm. Stagecoach rides will be available downtown from 1 to 5pm. Rides are free with the donation of canned goods for the Christmas Food Basket project. Also today, it’s an Old-Fashioned Christmas at the Old Mill. Experience the sights and sounds of an 1880s prairie Christmas across the museum grounds this evening from 5 until 8:30pm. There will be a variety of children’s activities, holiday music and tours of the old mill. In addition delicious holiday refreshments will be available and you can even do a little Christmas shopping in the gift shop. Admission is 2$ for adults and 1$ for kids 6 through 12. The Swedish Country Inn will be be selling Lucia Buns from 2 to 5pm today, and local artist Carla Wilson will be decorating holiday ornaments, all part of the Lindsborg Bed and Breakfast Open House. The Rosberg House and Seasons of the Fox are also participating. till next time, this is Mike Rodriquez with Lindsborg Town Talk. Over at the Red Barn Studio, puppet artist Michelle Meade will be the artist-in-residence through December 14th. During her residency she will study and draw inspiration from the toys and puppets created by Lester Raymer. Speaking of, Raymer’s Christmas toys are featured at the Red Barn during December. Downtown Lindsborg will be the scene of the children’s Snowflake Parade at 12 noon, followed by Santa’s Secret Workshop at nearby Soderstrom Elementary. The workshop runs from 1 to 4pm. It’s time for the 5th annual Lindsborg Artists’ Holiday Open House! Today, from 10am until 5pm, participating galleries and artists studios around town will open their doors so you can experience first hand the creative space of area artists. As in the past, a wide variety of artistic styles and mediums will be on display, and in addition, holiday refreshments will be served at participating studios. Also today, it’s an Old-Fashioned Christmas at the Old Mill. Experience the sights and sounds of an 1880s prairie Christmas across the museum grounds today from 1 to 4pm. If you can’t make it today, the Old Mill will present the Old-Fashioned Christmas again next Saturday evening, from 5pm until 8:30. Admission for either day is 2$ for adults and 1$ for kids 6 through 12. Finally, Bethany’s seventh annual Alternative Gift Market and Christmas Bazaar concludes today. The market will be open from 10 until 2 today. The location is the Phihlblad Memorial Union at Bethany College. I hope everybody had a safe and enjoyable Thanksgiving Holiday this year. Lindsborg continues to celebrate the holidays this weekend, when the Christmas Committee premieres community wide lighting! The event begins tonight at 5:30pm, at Mill and Second streets, with the lighting of the Smoky Hill Bridge. 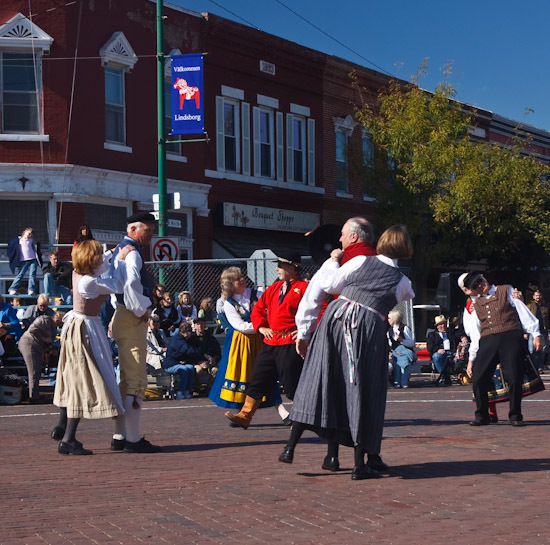 Then, onward to Lucia Park in downtown Lindsborg, with the grand finale at Swensson Park. There, the lighting of the Heritage Tree will take place, as well as a benediction by Mary Bridges and a community sing-along, complete with refreshments. A big hand to the Christmas Comittee for their tireless efforts to bring this special evening to life in Lindsborg. Over at the Red Barn Studio, puppet artist Michelle Meade will be the artist-in-residence through December 14th. During her residency she will study and draw inspiration from the toys and puppets created by Lester Raymer. Looking ahead to next Saturday, it’s time for the 5th annual Lindsborg Artists’ Open House on December 6th. From 10am until 5pm participating galleries and artists studios around town will open their doors so you can experience, first hand, the creative space of area artists. As in the past, a wide variety of artistic styles and mediums will be on display, and in addition, holiday refreshments will be served at participating studios. Also next Saturday is an Old-Fashioned Christmas at the Old Mill, filled with the sights and sounds of and old-fashioned prairie Christmas. I’ll have more details next week. Finally, Bethany’s seventh annual Alternative Gift Market and Christmas Bazaar is next Friday and Saturday. The market will be open from 11 until 2 on Friday and from 10 until 2 on Saturday. The location is the Phihlblad Memorial Union at Bethany College. 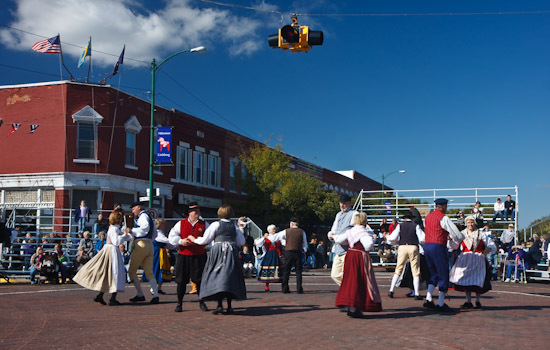 Lindsborg continues to celebrate the holidays this weekend, with special activities downtown. The Blacksmith Shop on North Main will be hosting live performers from 11am until 4pm. You can hear the vocal stylings of Molly and Tyler Johnson, guitar and vocals by Angel Andrewson and Mark Galloway, Genevieve Bishop on piano, the Bethany College Brass Trablas Woodwind Trio and the community carolers. Should be a lot of fun! Broadway RFD Celebrates 50 years of Music Theatre History! Enjoy a musical journey of favorite show tune selections that honor a half century of community dedication and local tradition. Sweet Fest is the first 50th Anniversary event for this historical year and features plenty of music and gourmet desserts. It will be hosted at the Rosberg Convention Center, tonight at 7:30 and again at 2:30 on Sunday. Call 227-3706 for more information. Throughout this holiday season you can help warm a child’s heart this Christmas. Children’s Angel Trees will be accessible at the Farmer’s State Bank, Lindsborg State Bank, and Bank of America. Drop by and pick an angel tag from a tree, purchase and wrap a gift worth at least 20$ and return it to the bank where you picked up your angel tag. Your gifts will help brighten the day for many area children. Today, November 22nd, the Friends of the Lindsborg Library will host a soup and chili luncheon as well as a local author fair. From 11am until 2pm, drop by the library to enjoy a bite to eat as well as meet some local authors! This Thanksgiving, Scott’s Hometown Foods continues an 11 year tradition of hosting a Community Thanksgiving Dinner. From 11 until 1:30, a full thanksgiving dinner will be served, for free, at the Bethany Lutheran Church. All Lindsborg residents are invited; to help with capacity planning, please sign up at the Senior Center or at Scott’s Hometown Foods. Unwrap the Magic of Christmas, this Saturday in Lindsborg! Local stores and galleries have a wealth of activities planned which will enhance your shopping experience, including unique products, sweet treats and arts and crafts demonstrations. Special shopping hours are in effect and many shops and galleries are open until 7:30 tonight. This weekend provides a great opportunity to see Lindsborg artists and crafters in action, as at least 10 businesses are hosting demonstrations today. They include the Courtyard Gallery, Studio Lindsborg, Swedish Crafts, Swedish Country Inn, Anderson Butik, the Boquet Shoppe, the Butcher, Baker and Candlestick Maker, Elizabeths, Small World Gallery and last but not least, the Hemslojd. Also tonight, Smoky Valley High will present the final performance of Rodgers and Hammerstein’s wonderful musical, Oklahoma! That’s tonight at 7:30 at the Smoky Valley auditorium; admission is 5$ for adults and 2$ for students. The American Red Cross is holding a blood drive Monday, November 17th, at the Messiah Lutheran Church in Lindsborg. The blood drive runs from 12:30 until 6:30. On Tuesday, November 18th the Bethany College Symphonic Band and Handbell Ensemble will be in concert at Presser Hall. The concert, which is free and open to the public, begins at 7:30. The concert will feature selections from a broad spectrum of musical styles and should be quite enjoyable. Next Saturday, November 22nd, the Friends of the Lindsborg Library will host a soup and chili luncheon as well as a local author fair. From 11am until 2pm, drop by the library to enjoy a bite to eat as well as meet some local authors! Don’t forget, stores are open until 7:30 today for your holiday shopping convenience.